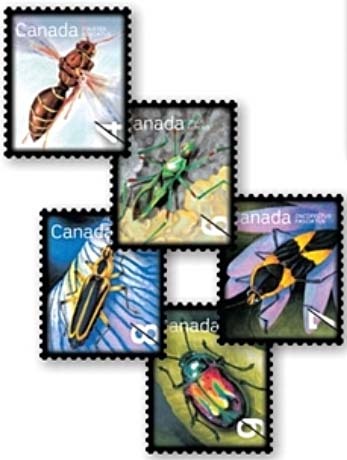 On October 19th, 2010, Canada Post began issuing a new series of low-value definitives featuring beneficial insects. This is the second issue with such a theme. The new denominations on these defintives will certainly help when it comes to calculating the correct postage for letters and packages according to the new Canada Post rates. The series of 5 stamps features the paper wasp, assassin bug, large milkweed bug, the dogbane beetle and the margined leatherwing. All of these friendly insects, despite the sound of some of their names, are appreciated by farmers and gardeners alike. Featuring bright, almost luminescent colours, these stamps will be sure to please collectors. 2010 CWS Canada stamp album supplements have arrived!